Here we are! 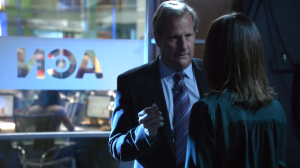 The Newsroom season 2 finale, I as a fan, didn’t want it to be so early but unfortunately this season was quite short and a season 3 hasn’t been announced yet. Maybe that explains this whole finale Sorkin should have called “All you need is love”. I don’t know if he’s been recently working for Hallmark or Disney but he seems to be quite sentimental as he offers quite a happy ending to all his characters, including Mac….whatever happened in the previous episode. Indeed, last Sunday’s episode ended with Mac being fired by Will, a decision not effective until the end of the election night show. Actually it’s the same for everybody as all the news team involved in Genoa sent their resignations but Leona is still refusing them, letting her son decides for her. It all depends on Reese’s decision. In Mac’s case it all depends on Will who suddenly takes a break during the election night in the make-up room. Mac quickly follows him to talk about his decision of firing her. She admits she thought he wouldn’t do it because he was still mad at her for what happened in the past. Yes still this old story of Mac cheating on him but also about Will’s desire to propose her at that time. Unsurprisingly he still refuses to admit he still has the ring in his office. Meanwhile Don is pissed off by Jerry Dantana who is suing him for writing a bad recommendation letter. I’ve to admit that the more this season went the more I loved Don. He is funny, sarcastic but he also shows some sensitive. He’s even about to cry as he says to Rebecca he doesn’t want to resign because he loves his job. He is not only sad or angry but he’s scared by the idea he could lose it. At the same time Sloan is still trying to find the person who bought her book with the fake signature so she could excuse herself for it and offers him her book with her real signature. With Neal’s help she discovers this person used a nickname created with some Hollywood celebrities’ names. Thinking she won’t ever find this person until she notices a movie poster in Don’s office and understands that it’s him. She goes to the control room, signs her book in front of him making clear that she knows before she kisses him. Another pairing of the show is also dealing with their problem: Jim and Maggie. I don’t buy this love story between Jim and Hallie, I prefer them when they were sneering at each other finding them quite funny as “enemies” but for me they’re not doing ok as a couple. Ok maybe I’m saying this because I ship Maggie and Jim. Their complicated relationship is actually going to an end as Jim meets Lisa – yeah remember the girl he was dating in season 1 and who happens to be Maggie’s roommate. They discuss about what is happening to her, and the change of her haircut. Lisa confirms Maggie did that to herself and learns by Jim that something went wrong in Uganda. Not only he is starting to fix his relationship with Lisa and soon Maggie but he is trying to fix the two girls’ friendship. As much as I love the show, it appears to be a little too much cheesy. Well at least we finally have the confirmation Maggie cut her hair because of what happened in Africa because she felt guilty and feeling weak. During her conversation with Jim they both remembered the day her arrived in the building and how though he appeared. The way he didn’t give up about the BP oil spill and how much she wants to be like him. Don’t worry Maggie you’ll have a lot of time to work harder and improve yourself. Indeed Charlie comes to Will’s office to talk about Genoa and why now he refuses everybody’s resignation. He is defending himself by saying this whole disaster was just a damn institutional mistake and that they have waited for 11 months before running the story. Will say he can’t live with Mac taking all the blame which apparently provokes something deep down inside. Something more personal and unexpected. He grabs the engagement ring he never returned and runs after Mac to propose her admitting he still loves her and will love her for the rest of his life. Ok, I was definitely not seeing that one coming but Will’s proposal was good. It’s funny to see how this charismatic man seems so lost when it’s about Mac. Aaah the power of love. Hurrah Mac accepts and they announce their engagement to the News team shortly after Reese Lansing announced to Charlie he won’t accept anybody’s resignations. So nobody is losing his job. Sloan and Don kiss. Jim and Maggie’s relationship is fixed and so is Maggie and Lisa’s friendship. Will and Mac are getting married. They all lived happily ever after….well till the season 3, if there’s one.